As per the reports, it is said that in less than 24 hours, the film managed to do a business of 1 lakh at the box office. Sultan movie screen count, ticket prices in various states and occupancy reports are waiting for you. Take a look. At the moment, if you take a closer look at the BookMyShow, PayTM, and other ticket selling networks, tickets are quite handsomely available. The ticket prices will range from 150-300* as per your desired theater. You might not find in few places like Bandra and more. Do pick your ticket quick. Sultan movie tickets are available in Hyderabad. First, come first serve, pick them fast. Sultan ticket prices in Hyderabad will range from 150-200 not more than that. There aren’t any big releases this week. The flick might do good business here also. Also, tickets are available in Chennai. Prices vary from 100-200. Bangalore is quite costly, and ticket range from 200-500 and the tickets are available. Even in Delhi, ticket are available for the talkie. Book them now for this EID. There are plenty of ticket in Jaipur too. The price varies from 100-200 in Jaipur. The pink city will surely do good business for the movie. Bangalore is an expensive city and ticket vary from 200-500, and the ticket is available. The flick is coming out in huge numbers. The film will be hitting India with more than 4500 theaters. Yes, you heard it right. In overseas, Sultan will be released in UK, USA, UAE, New Zealand, Pakistan, Australia and few more places. The screen count in overseas is around 850+ screens. Isn’t that huge? Whereas coming to the occupancy, since Bhai has got an immense following, the talkie will get an occupancy of 70-90% as per box office analysts. Madaari starring Irrfan Khan in the lead role to look out for just as the film hits the theaters. Madaari might give some trouble if gets a positive talk. The advance booking opened in India on July 3 (Sunday). It began with a phenomenal response. 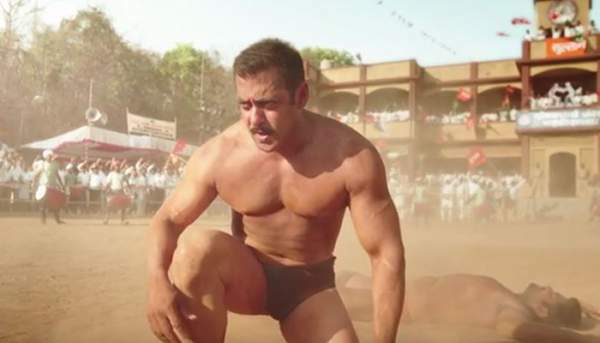 The tickets for the Sultan sold out instantly for several multiplexes and single screens. The ticket are being sold in advance not for just the opening day but even for the first weekend too. More than 50 percent occupancy has already been registered in less a day. It’s the time for film mania now as the record breaking spree has started even before the release. Ticket more than Rs. 1 lakh got sold within hours of the opening the advance counters. At Maya Gorakhpur, 1700 tickets sold in 3 hours. History is going to be re-written with the flick release. The ticket counters at Smruti (Nagpur) sold ticket of more than Rs. 1 lakh in just 2 hours. It looks like talkie madness is on. Not even in India, the movie fever is getting high in Pakistan too. Sultan box office collection record will become a special record considering the worldwide collections. The film has got a 10-day opening right before Madaari releases. Let’s hope for the best. In case you missed Sultan teaser and trailer, you can watch them, right below. Share your comments on the article. Stay connected to The Reporter Times for latest news regarding the Sultan advance booking and all other Bollywood movies. Don’t forget to share your thoughts and views with us via commenting below. Share it on social media sites like Facebook, Twitter, Google Plus, etc. to let others also know.